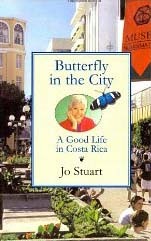 Butterfly in the City by Jo Stuart is one of the best books I’ve read on Costa Rica. 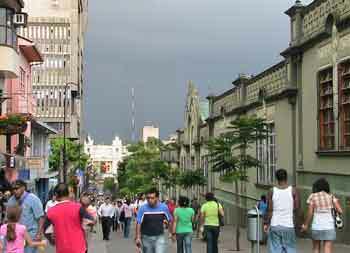 As the name implies, she is the “butterfly” and the city is San Jose, Costa Rica. Most other books on Costa Rica are guide books about its natural beauty – waterfalls, beaches, flora and fauna – with recommendations on hotels, B&Bs, hostels, attractions, and restaurants. But this book is about how to adapt to the culture. It’s the story of Jo Stuart’s day-to-day life, of her city, and of the people of Costa Rica as seen through her eyes — the eyes of a single woman who wanted a new experience. She retired and settled here over 20 years ago, in the early 1990’s. She had been looking for a place where she could live simply, within a limited budget, and without “owning anything.” After a couple of visits, she chose Costa Rica, feeling comfortable in a country without an army, and at home with the culture and people.